Simple, interpretation, on the go. Visage Ease Pro is an FDA 510(k) cleared, native iOS mobile application that provides users the ability to interpret all diagnostic imaging studies (other than mammography) that are stored on a Visage 7 server. Consistent with general FDA principles for mobile apps, mobile devices should only be used for diagnosis in situations where no full diagnostic workstation is available (and not for mammography). Diagnostic interpretation using Visage Ease Pro should also only be performed on iPads due to the available screen real estate, with a user alert displayed when Visage Ease Pro is used on the iPhone. Because it’s powered by ultrafast server-side processing, Visage Ease Pro provides secure, fast access to even the largest multi-gigabyte sized studies via the convenience of your mobile device. Care providers require intuitive imaging results, and Visage Ease Pro delivers. Compared to x-ray film or patient CDs, the Visage 7 Enterprise Imaging Platform in combination with Visage Ease Pro provides a much richer and convenient form of imaging results communication. Authorized users have access to imaging results, when and where they need it. Developed as an native app, Visage Ease Pro imaging results are intuitively displayed in portrait or landscape mode, and are optimized whether viewing on iPad, iPhone or iTouch devices. 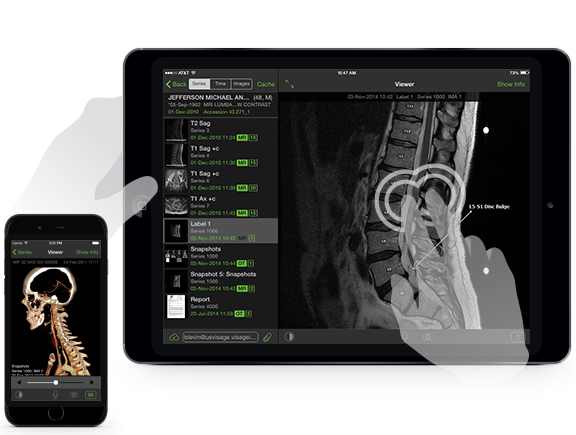 Visage Ease Pro enables the visualization of images, as well as the radiology report (if available), taking advantage of iOS’s multi-touch gestures and Visage Ease Pro image controls for optimal usability. Visage Ease Pro requires the end user perform necessary calibration checks to ensure the display and environmental conditions are sufficient for diagnostic interpretation. For multiplanar reformatting (MPR), users are able to reformat cross-sectional imaging studies on-the-fly, displaying multiple thick-slice preset presentations from original thin-slice data; AvIP, MIP and MinIP presentations; as well as re-orientation of the datasets (Anterior/Posterior, Left/Right, and Head/Foot). All imaging modalities supported by the Visage 7 Enterprise Imaging Platform are available for rapid display via Visage Ease Pro, even for example, massively large DBT and Cardiac CTA studies. DICOM Window/Level presets tied to a user’s Visage 7 profile are available on Visage Ease Pro.